Dear Applicants, Are you searching for SSC GD Constable Notification 2018-19 ???? If yes then here is good news for you. Staff Selection Commission has released SSC GD Constable Recruitment 2018-19 Notification for CAPF, BSF, ITBP, Assam Rifles NIA and SSF on 24th July 2018. In the notification, there are a total of 54953 Constable Vacancies under Various Departments. Submission of Online application for SSC Constable GD Recruitment has start from 17.08.2018. Closing Date of filling online form for SSC Constable Vacancy is 17.09.2018. Staff Selection Commission has issued SSC GD Constable Vacancy notification for filling up 54953 Vacancies. Those candidates who are interested in GD Constable Bharti then this is a great job opportunity for them. Applicants can check Department wise SSC Constable Vacancy & also check eligibility criteria Require for filling online form for SSC Constable GD Recruitment from here. In the below section out team is providing full details about SSC Constable GD Recruitment 2018. 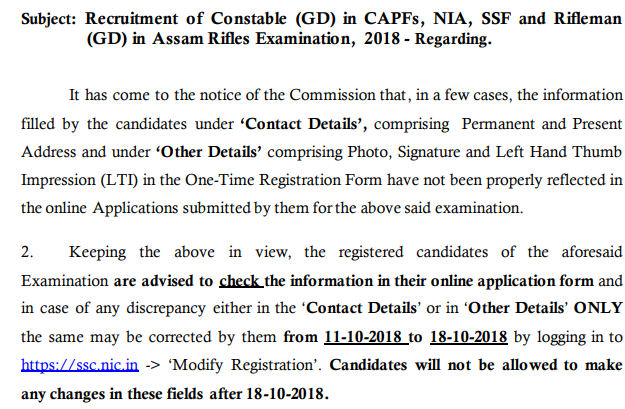 Latest Update as on 16th October 2018: Dear Applicant, If you want to modification of your SSC Constable GD Application Form then you can modify your contact details and other details. The modification is available from 11.10.2018 to 18.10.2018. Visit here on a regular basis for more latest information. Latest Update as on 16th August 2018: Staff Selection Commission (SSC) online application form for Constable (GD) is available from tomorrow on 17th August 2018. The last date of submission SSC GD Constable Online Form is 17th September 2018. For more details check below notification. Fresh Update as on 31.07.2018: Staff Selection Commission GD Constable Recruitment online registration is postponed due to the very heavy load of the application. The new official site has become very slow and candidates are facing problems of one-time registration and online application submission. So the department decides to start commencing of SSC GD Constable Online Form is available from 17.08.2018. Applicants those are interested and eligible also may apply through online mode before on 17.09.2018. Latest news as on 23.07.2018: Staff Selection Commission has released the notification for filling up 54953 Constable GD Vacancy. The online registration for SSC GD Constable Recruitment will start on 24.07.2018. 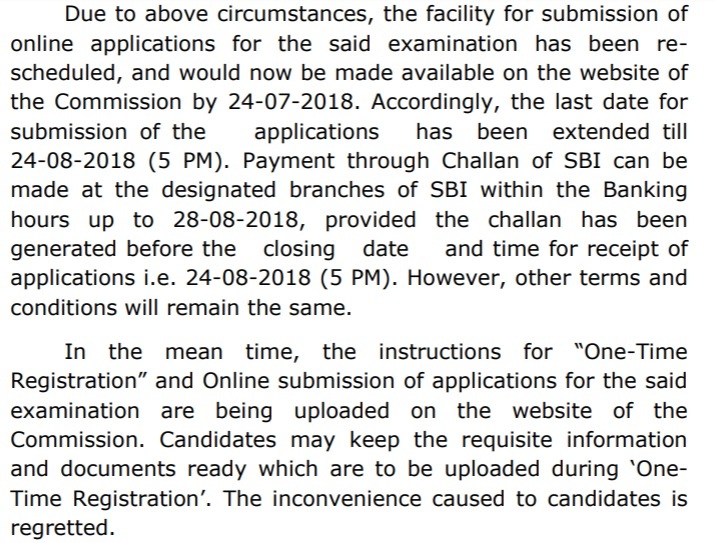 The last date for online registration is 24.08.2018. For more details read given below notification is careful. Latest news as on 09.07.2018: Staff Selection Commission will going to release SSC Constable GD Notification on 21.07.2018. Applicants who are going to fill the application form can apply online here. The direct link to fill the online form will activate very soon. 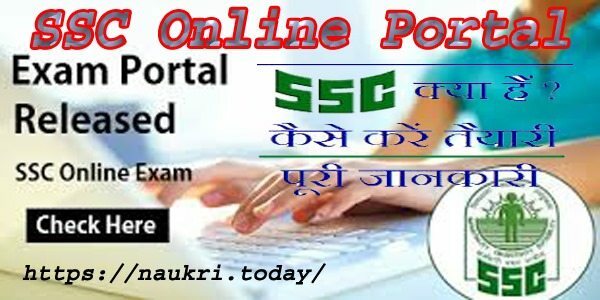 What are the Important dates for Filling SSC GD Constable Online Form? How To Check Exam Fees, Pay Scale & Selection Criteria For SSC GD Constable Bharti 2018-19? Dear Applicants in this section we are providing Division of Constable Vacancy under SSC GD Recruitment. You can also check these vacancy details from SSC Notification, which is issued soon. Applicants who are interested in SSC GD Constable Vacancies 2018 can check required eligibility criteria from this section. Here full details about education & Age Criteria For SSC Constable GD Recruitment is mentioned. Candidates can also check these details from official Staff Selection Commission Notification. Candidates must have passed 10th (Matriculation) from any authorized Board for SSC GD Constable Recruitment 2018. More information about Education Qualification for SSC Constable GD Vacancy you can check from official advertisement. 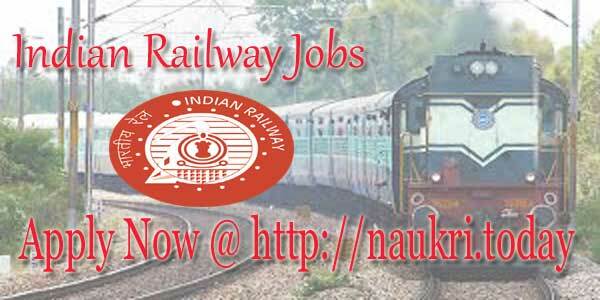 Minimum age of the appliers for SSC GD Recruitment 2018 must be 18 years & Maximum age for Constable Jobs must be 23 years as on 01.01.2018. Relaxation in age for SSC GD Constable Jobs is applicable as per department rules & regulation up to 05 years for SC/ST & 03 years for OBC. Male Candidates of General/OBC Category must need to pay Rs. 100/- as application fee for SSC Recruitment 2018. All other category candidates need not pay any application fee for SSC GD Constable Recruitment 2018. Fees must be deposit through online or offline any mode. Applicants who will select for SSC Constable GD Vacancies will pay Rs. 21700/- to Rs. 69100/-. Other details about the SSC GD Vacancy pay scale you can check from the official notification. More information Check SSC Constable GD Exam Syllabus. Those candidates who are interested in SSC GD Recruitment 2018 For Constable Jobs can fill application form here by using the below steps. Candidates must read the below steps which is helpful for filling online form for SSC GD Constable Vacancies. Firstly Applicants log on to the official website www.ssc.nic.in. Now click on Official SSC GD Constable Notification PDF Link. Read all the information in Staff Selection Commission GD Constable Notification properly. 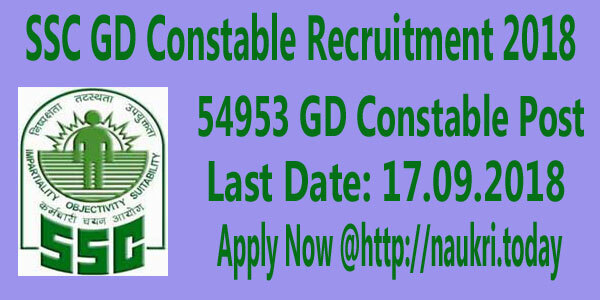 If you are eligible for SSC Constable GD Recruitment then click on Apply Online form Link. First candidates fill the registration form Properly & Start filling online application. Appliers must fill all the required information in the online form. After that upload your scanned passport size photo & signature in form. Now deposit examination pay through online or offline mode. Now Take a print out of SSC Online form for future reference. Conclusion : – SSC GD Constable Recruitment 2018 For 54953 Vacancies. Applicants can fill online form for SSC Constable GD recruitment 2018 on or before the closing date. For more details, you can check official SSC Vacancy notification & also check from the above article.